She collaborated with Lisa Voong, B.F.A. Textile Design, who grew up in Oakland, California. Lisa received an Honorable Mention at the Stylesight Competition in 2013. Her textiles were created on black Borsalini cotton and white Devore poly/viscose. Lisa connected the textures and shapes from Holy Mountain with M.C. Escher’s use of negative space and imagery transitions with the detailed work of Jonathan Brechignac’s Blue Carpet. Lastly, Zoe Cope, B.F.A. Jewelry and Metal Arts, contributed unique pieces made of etched copper, laser cut acrylic, spray enamel, and leather straps. 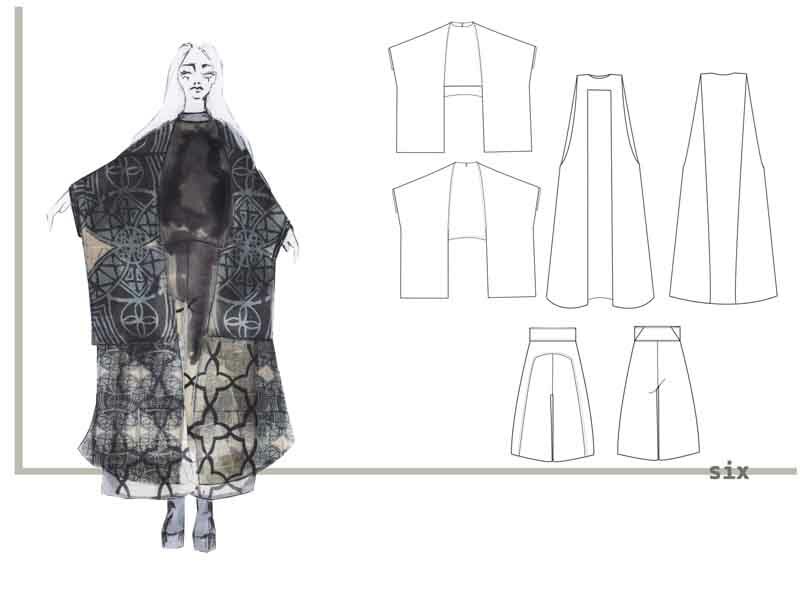 Geometry, ethnic armor and modern shapes inspired her pieces. Zoe is from New York, NY and was raised in Santa Monica, California.